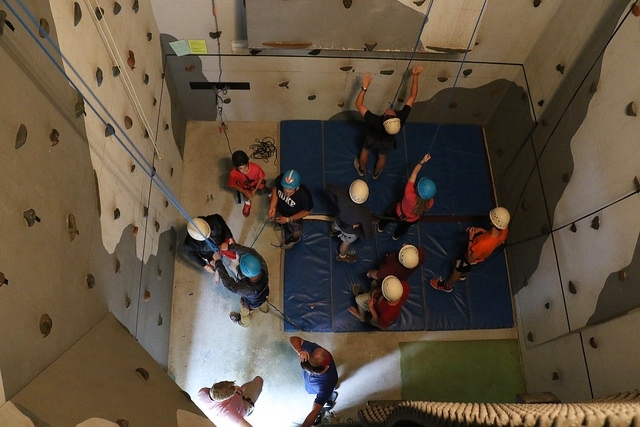 The 37 foot Climbing Wall is one of the biggest attractions at Silver Birch Ranch. It features six outside walls and four heated inside walls, all with varying levels of difficulty. The wall is used all year round, so prep yourself for a new kind of challenge. Along with climbing the wall, we now offer the Leap of Faith, a 30 foot drop from inside the wall. Do you trust the rope to save you? The Zip Line consists of three lines. Two lines run from the top of the Climbing Wall to a tree-top canopy, and the third runs from the canopy to the base of the Climbing Wall. Campers connect onto these 300 foot long cables and zip 45 feet above the ground. 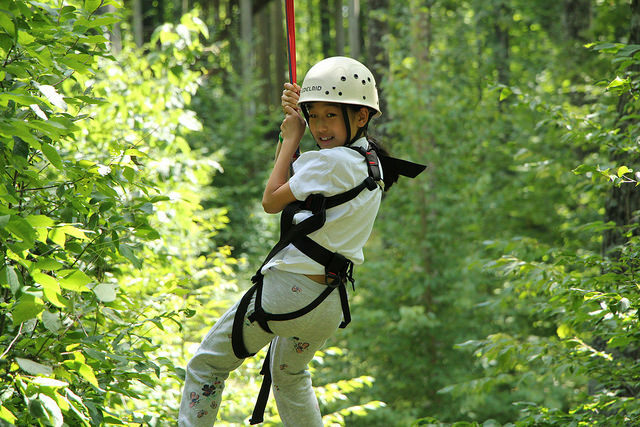 For all of these activities, you will be trained and belayed by our certified staff. The stables at Silver Birch Ranch play a big part in the camp experience. Horse rides can be enjoyed by all campers and retreaters year round. All trail rides go through the beautiful woods of the Nicolet National Forest. 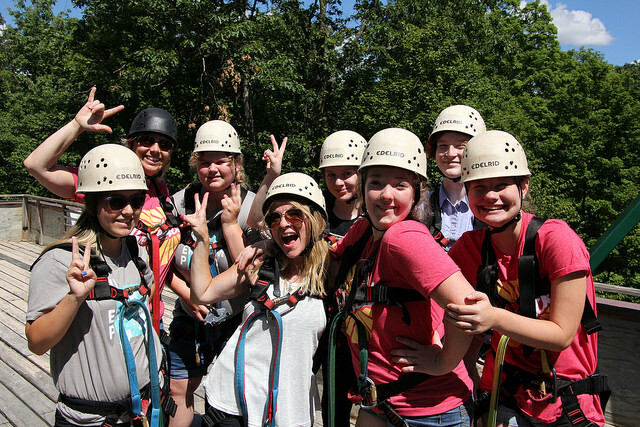 Riding Adventure Camp is also offered for horse-loving junior high aged female campers during Junior-Middler and Junior High summer sessions. If you love the horses at Silver Birch Ranch, consider the Adopt A Horse Program! Silver Birch has a variety of sports courts. We have sand volleyball, basketball, tennis, gaga ball, 4-square and 9-square courts. Whether you're a serious athlete or just want to have fun, we have the facilities to help you have a good time. Most of these activity areas are also lighted for use at nighttime. 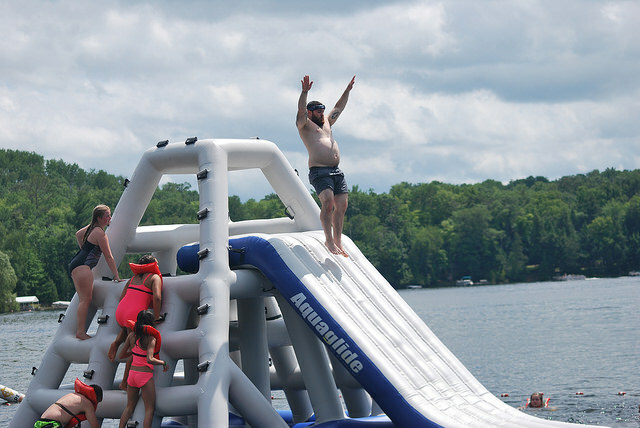 During the summer, our waterfront area features a rope swing, slide, iceberg, water mat, and diving board. We have a full fleet of splash boats, canoes, rowboats, paddle boats, kayaks, sailboats, and 2 professional ski boats for use anywhere on the main area of beautiful Sawyer Lake. Masks are on. Tippmann Alpha Black guns are full of ammo and choreographically timed to shoot at 280 feet per second. A 300x120 foot course beckons; bunkers are strategically placed for optimum coverage and positioning within. Game on. 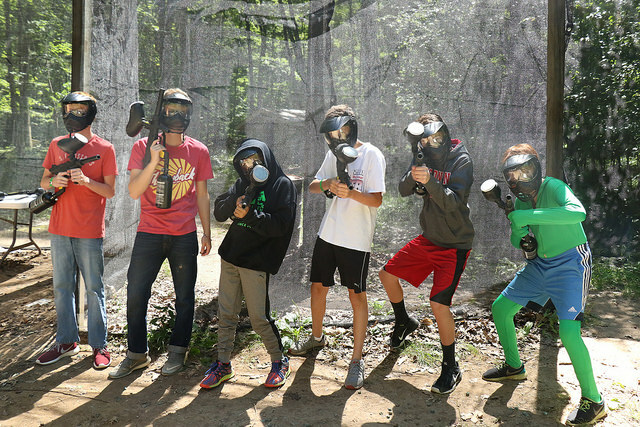 The low cost of $5 per hopper-allows over 200 paintballs-guarantees that everyone can join in and experience the heart pumping, adrenaline-centered adventure that is paintball. Come and try out the game of your choice: Team Elimination, Capture the Flag, Predator vs. Prey, President, or Assassins. Trained staff members remain on site, always managing the activity - delivering a detailed orientation, running the requested games, and providing a stress-free, safe environment. This activity has become very popular at Silver Birch Ranch. The beautifully landscaped trap range has 5 stations to shoot from, two automatic pivot throwers, and 12 or 20 gauge Remington 870 pump action shotguns. The shotguns are of varying size to accommodate younger inexperienced shooters up to experienced adult shooters. Our well-trained staff are prepared to train shooters who have never picked up a gun. If you have years of experience, we have a range that will challenge even the best shooter. The shooting area is canopy-covered so you can enjoy this activity rain or shine. You are also welcome to bring your own shotgun. All safety equipment is provided. When the trap range is staffed by SBR staff, your group is welcome to shoot your own guns on our pistol range. Feel free to bring your own pistols or small caliber rifle. 22 cal. rifle and 9mm pistols or smaller are preferred. The local township asks for smaller caliber because of neighbors, safety, and noise. The range has large shooting benches, paper and metal targets, large side and back dirt mound backstops with maximum range of 100 feet. The shooting area is canopy-covered so you can enjoy this activity rain or shine. Follow the range rules on caliber size on target. Only small caliber rifles are allowed. SBR does not provide any pistols or small caliber rifles. The Craft Room is a great place to create all sorts of memories with your cabin mates. Come make a bracelet, paint a picture frame, or tie dye a shirt in the Silver Birch Craft Room. Whether you're experienced or a novice, we've got all sorts of targets at the Rifle and Archery pit. Come and take aim and see who is the best shot in your cabin. Whether you want to spend time alone or with a bunch of friends, the Mini-Golf Course is a great place for a laid back afternoon. The playground is a great place to enjoy the equipment there, for a game of tag, or a place to sit and talk. Wagon Rides: Our wagon rides are for young and old. We pull our wagon with a tractor or horses. Rafting: Living close to the Wolf River is great for us at SBR. We take groups tubing and rafting there. Guests will experience whitewater and lots of rocks. Whitewater can be unpredictable. Our staff, trained in swift water rescue, make sure that the adventure is as safe as possible. 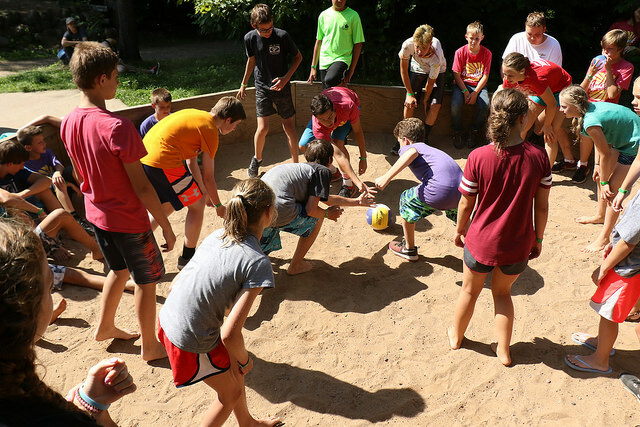 Group Games: Summer camp is synonymous with group games. Our games are designed to be safe. At times, people collide with a giant earthball or other guests. Our staff works hard to ensure that the games are fun and safe. Disc Golf: Enjoy a nine hole game of disc golf spanning the grounds of Silver Birch Ranch. 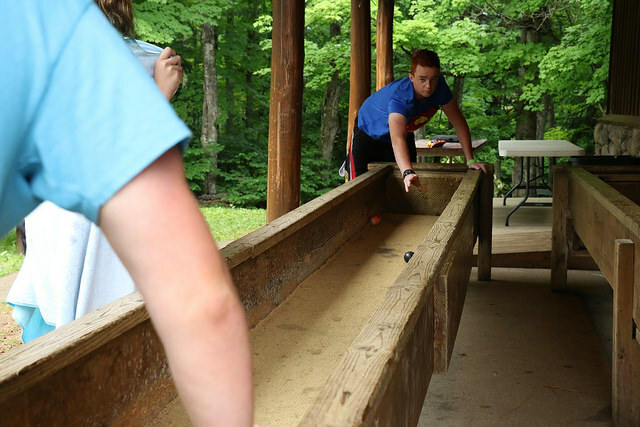 Table Games: We've got Ping Pong, Foosball, Box Hockey, and Carpetball.